Tropical cyclones are the deadliest tropical weather systems. This chapter describes their seasonal and geographic variability and controls, decadal cycles, and history of naming conventions. Tropical cyclogenesis is explored in depth and the core and balance solutions for regions of the cyclone are examined. Intensity is considered in terms of inner-core dynamics, large-scale environmental controls, limits on potential intensity, satellite interpretation techniques, and classification by wind speed. Factors that influence motion are investigated. Extratropical transition is described in terms of structural changes, preceding mechanisms, and impact on high latitudes. Societal impacts and mitigation are also covered. Very detailed information on tropical cyclones, factors which influence tropical cyclone intensity, and major intra and interannual factors which impact how active a tropical cyclone season will be for a given basin. 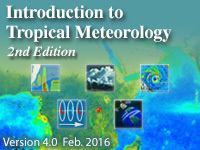 A course to fully read, understand and analysis all aspects of developments before issuing of TC forecasts. Well put together and informative. February 15 2016: HTML and media assets in this lesson have been updated for current browsers and mobile devices. All links external to COMET's MetEd site have been checked and updated.